The new flights connect Minneapolis/St. Paul with Seoul, South Korea, and Seattle with Osaka, Japan. Flights are first additions to the Delta-Korean joint venture's network since the partnership launched in May 2018; Boston-Seoul service operated by Korean Air also launches April 12. In addition to enjoying among the best connections between the Midwestern U.S. and Asia, customers on Delta's new Seoul-Minneapolis/St. Paul flight will enjoy will airline's award-winning service onboard a newly upgraded 777-200ER. 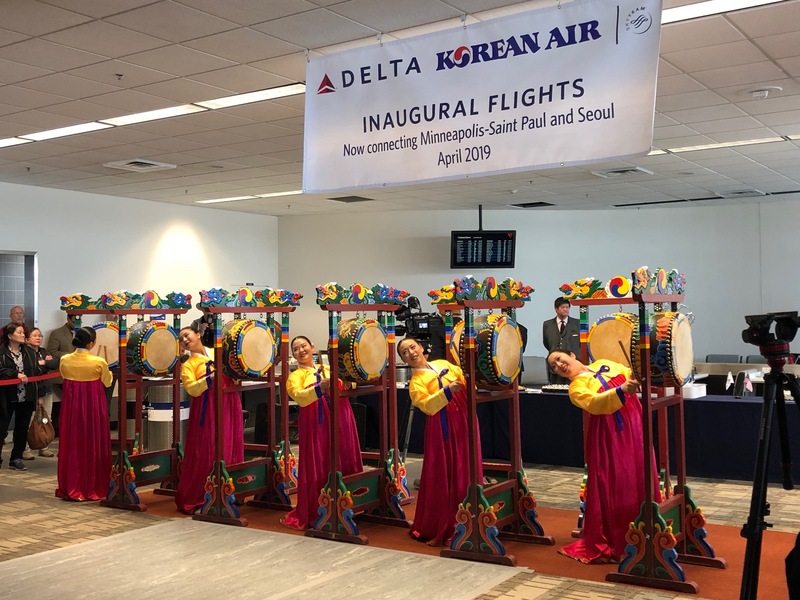 "This new flight from Minneapolis furthers the economic development of both cities and serves to create an even tighter link between South Korea and our region," said Bill Lentsch , Delta Executive Vice President – Flying/Air Operations, at an April 1 ceremony celebrating the new service. "Connecting the world is our mission, and in Seattle, Delta and our joint venture partners bring the world closer each day with flights to 15 international destinations and even more throughout the United States," said Tony Gonchar, Delta's Vice President – Seattle. "Our Osaka service continues that mission, giving Seattleites direct access to one of the largest cities and business centers in Japan and the opportunity to explore our nearby Seattle sister city – Kobe, Japan!" John Jackson, Korean Air’s Vice President of Marketing, said, "These new flights bring Asia a lot closer to Minneapolis. The Korean Air and Delta joint venture has created the most comprehensive trans-Pacific route network with 80 Asian destinations now just one stop from Minneapolis. And that stop is Incheon, rated the world’s best airport and offering international connections in just 45 minutes. This is an exciting start to a joint venture that’s geared for success." Delta operates more than 150 peak-day departures to more than 50 destinations from its hub at Seattle-Tacoma International Airport. Delta is Seattle's fastest-growing airline, growing by more than 50 percent since 2012 and 5 percent this summer.